Ornamental grasses are becoming more well-known all the time, so why not create a flower bed using grasses? Most people probably wouldn't think of this, but these fabulous grasses can really make your flower bed into something unique and special. Ornamental Grasses fit into the flower garden very easily. They can fill in a space between two showy plants, or can provide a contrast of texture and color. Grasses are fairly pest-resistant, and many species also do well in drought conditions. Grasses can grow in very poor soil in many cases, and are very easy to maintain. The term "ornamental grasses" are applied not only to grasses, but sedges, hardy bamboos and rushes. You'll find grasses that thrive in dry sandy soil, in moist water-laden soil and everything in between. So, why not create a flower bed using grasses? 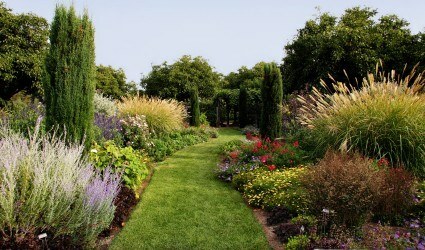 You'll find yourself the envy of all your neighbors because your garden is so beautiful with all these unusual plants. Grasses can be grown in container gardens, Japanese gardens, rock gardens, water gardens, xeriscape gardens, wildlife gardens and more. There are so many varieties that you will find the clump that just screams to be planted in your yard with very little effort. Grasses easily catch morning or evening sunlight, creating a lovely halo effect. They add a wonderful vertical effect to gardens, even in winter. The slightest breeze will stir them, creating movement in the garden. you will get the soft sound of rustling grass whenever the wind stirs them. Sound is another difficult aspect to get naturally in the garden. When choosing an ornamental grass for landscaping, you'll want to note what type of spreading habit it has. Clump varieties pretty much form a nice uniform clump. They grow slowly in girth, and play nicely with other plants in your garden. Running varieties (like most lawn grasses) spread quickly through the use of runners beneath the soil. You'll also want to note if your favorites are warm weather grasses or cool weather grasses. Warm weather grasses will not begin their spring growth until the soil has warmed up sufficiently to make them happy. 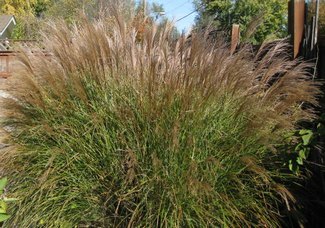 Some warm weather grasses include Northern Sea Oats, Hardy Pampas Grass, Switch Grass and Fountain Grass. Cool weather grasses will begin their new growth as soon as early bulbs and flowers begin to poke up out of the soil. Some varieties of cool weather grass include Fescues, Blue Oat Grass, Autumn Moor Grass and Tufted Hair Grass. Some of the more unusual grasses include black Mondo grass, which really almost looks unreal because of its deep black color, Japanese blood grass, with its broad upright leaves tipped with bright red and some of the golden Japanese forest grasses, which look like tiny mounds of bamboo. Imagine the amazing textural variations this will add to your garden when you create a flower bed using grasses. Bunny tail grass, which is a type of fountain grass, has soft fuzzy seed heads that do indeed resemble bunny tails. Some of the fine leaved varieties look like small clumps of hair growing out of the ground, which can make a wonderful contrast against plants with broader foliage. When you decide to create a flower bed using grasses, you are opening up a whole new area of plants to choose from that runs the gamut from these fine hair-like clumps to tall broad-leaved specimens like bronzed millet. Some of them offer amazing seed heads that will dry during late summer and offer some wonderful shapes in the garden all winter long. If you suffer from hay fever, stick to grasses that don't form large obvious blooms. Some of the finer grasses like Mondo grass and the more exotic like Japanese forest grasses may work better for you. Aside from this small caution, enjoy your foray into ornamental grasses. You won't regret adding them to your flower bed.